The M9.4 flare on Oct. 23, 2013, was associated with a coronal mass ejection or CME, a solar phenomenon that can send billions of tons of particles into space that can reach Earth one to three days later. These particles cannot travel through the atmosphere to harm humans on Earth, but they can affect electronic systems in satellites and on the ground. Another solar flare erupted from the same area of the sun on Oct. 25, 2013,which peaked at 11:03 a.m. EDT. This flare is classified as an X2.1 class. To see how this event may impact Earth, please visit NOAA’s Space Weather Prediction Center at http://spaceweather.gov, the U.S. government’s official source for space weather forecasts, alerts, watches and warnings. Increased numbers of flares are quite common at the moment, since the sun’s normal 11-year activity cycle is currently near solar maximum conditions. Humans have tracked this solar cycle continuously since it was discovered in 1843, and it is normal for there to be many flares a day during the sun’s peak activity. The first X-class flare of the current solar cycle occurred in February 2011. 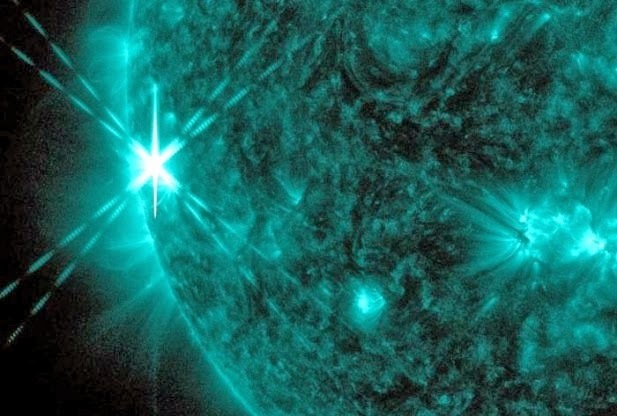 The largest X-class flare in this cycle was an X6.9 on Aug. 9, 2011.